If your business sends out mail on a regular basis, there is a good chance that you have struggled to find a mailer that provides superior protection of the contents. All too often, mailers tear and puncture or the seal loosens to expose everything inside. This creates a risk that the contents will be dirty, wet, or missing altogether when the mailer arrives at its destination. To solve these and other problems, you need to check out Polypak PackagingSM’s Mighty Lite® Mailer. To gain a better understanding of what makes the Mighty Lite® brand mailer so unique, start by looking at the material used to make it. 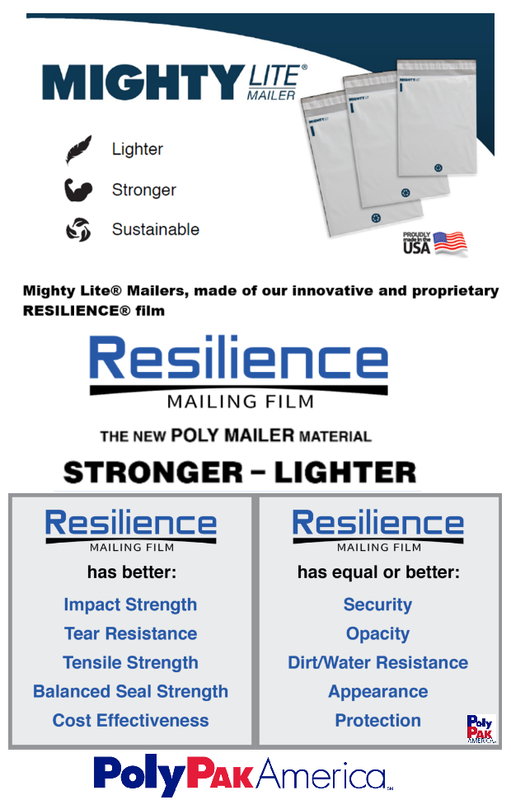 This type of mailer is made with Polypak PackagingSM’s highly innovative and proprietary blend of pure virgin polyethylene known as RESILIENCE®. That alone sets this poly mailer apart from all others. Mighty Lite® mailer in 2 mil is not only lightweight, it is also incredibly strong, durable resistant to tears and punctures, anti-stat pull strip and even more sustainable. Mighty Lite® mailers are fully customizable poly mailers where you can have exterior and inner lining customized, printing your logo or some artwork allows you to appreciate the true value that these mailers provide in marketing your brand. You can also select from a single seal closure or dual Re-PAK™ closure. Mighty Lite® shipping mailers will reduce your stress level, increase productivity, and improve customer relationships. The ideal slip level is tailored specifically to your manufacturing environment and the outstanding impact strength, which provides an extremely high level of protection. Even the Sure Safe closure made with a pressure-sensitive adhesive that prevents the possibility of tampering will make your life easier. Manufactured with strong and durable Resilience® film, your days of worrying about the mail contents are over. Your mail will arrive at their destination in the same condition as mailed. At Polypak PackagingSM, we carry the Mighty Lite® poly shipping mailers and many other mailing and shipping solutions. Please visit our website www.polypak.com to view all of our products or contact us today at 323-264-2400 to speak to our team expert.